This comment was posted to reddit on Jan 23, 2015 at 6:26 am and was deleted within 8 hour(s) and 29 minutes. Hey. The previous two comments were good and quite helpful I would imagine but even once you get your resume perfect and the sections and layouts all how you want it, then you still have one other problem that I found out about the hard way, especially if you're looking for a job in PR which can be a quite competitive area. Almost all companies use computer software to scan and read over the resumes of applicants applying for a position. This software called applicant tracking software (ATS) scans your resume looking for specific keywords relevant to the position that you're applying for and even if your resume and its layout is perfect, if you don't have those keywords included on your resume, the ATS will simply just discard your resume and an actual person won't even get the chance to read it. The ATS only submits and passes the top resumes that have those keywords included so the hard part is knowing which keywords they're looking for to include on your resume. Which I had the same problem. Had an excellent resume, strong experience and education but wasn't getting many interviews or callbacks and couldn't figure out why. So I did some research and found out about ATS but didn't know how to solve the problem. So I did some more research and found this website www.jobscan.co which saved me. I got three interviews the following week after using their site. It's soo easy too. All you have to do is copy the job description for the position that you're applying for, you paste it onto the website and within seconds, jobscan will tell you which keywords you keep to include to your resume to get it past the ATS and into the hands of an actual person. They will help you get your foot in the door for the interview, the rest will be up to you. Hope you check them out and see how they can help you. Good luck with the resume and the job search. MS in Physics seeking Materials Scientist/Engineer job [Comments & Critique] Currently in college, hoping for an internship next summer. Kindly critique my resume. I am new to u/resumes and I am applying for full time positions and i will be graduating in a month. Thanks Do you have any hard and fast resume rules? Applied for 34 "entry level" jobs in 2 months - not a single interview! Why? Just whipped up my first resume in Photoshop, not sure if I did this correctly. 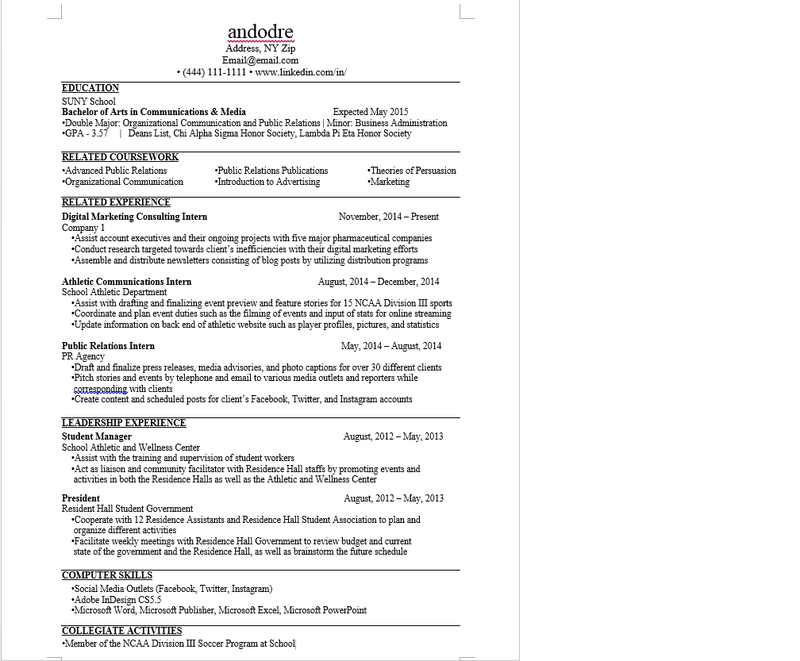 Dear Employers... Dear Employers... 2nd Year College Student, Please critique my resume! When interviewed, when asked "what is your greatest weakness", what can I say that doesn't make me look bad? Honest feedback please. Business Grad resume Dear Employers... Tear apart my cover letter, how can I improve on this??? Hi Reddit! Executive Drafts, a career coaching and resume service, is here to answer your questions and critique your resumes! Bring it on!